I remember him telling me he used to live with and work for a traveling carnival. The work was hard, but he couldn't quit and go home. There was no place for him there anymore. His father had pulled a gun on him. His mother had called the cops. His brother told him he'd be safer out on the road. Somehow he hooked up with this carnival, hitch-hiking probably. They were on their way to the next setup. He was just on his way. He was good with his hands, understood how things were suppose to work. His help was a genuine advantage, not a hindrance. They made a place for him on the floor in one of the caravans, gave him a box to put his stuff in. The food they offered wasn't bad. After a while he progressed to where they'd even let him run a few of the rides, whenever the regular guy wasn't around though. There was a definite pecking order. He'd never be one of the bosses. He'd never be in charge of money. One thing he'd never forget. Whenever there was trouble, there wasn't a man in that crew who wouldn't stand beside him. He'd never known anything like it. Not even his own brother would have done that. In the end, he'd left because of a girl, one he'd met in one of the towns where they'd set up. But it didn't last. They were on each other's nerves inside of two weeks. By that time, the carnival was long gone. 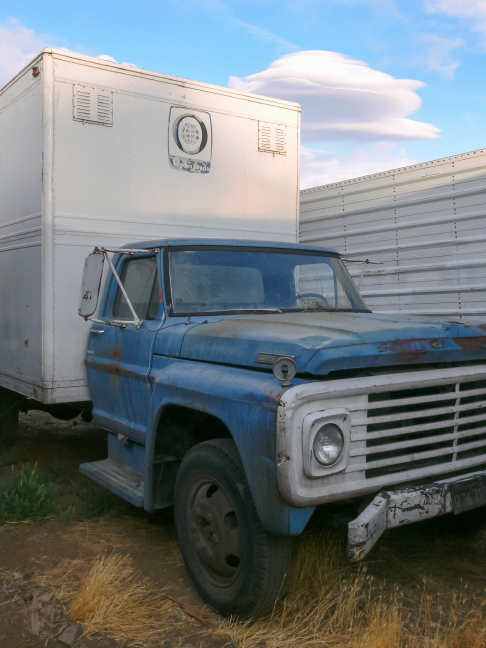 Strange how an unusual cloud and an old vehicle in a junk yard can conjure up such memories. We are all altered by circumstances, bruised, battered, corroded. There is no other choice but to endure and move on.